My husband and I recently took a fabulous trip out to Napa Valley/Sonoma/San Francisco. It was a whirlwind trip filled with good wine, great food, driving along Highway 1, and spending time with the love of my life. 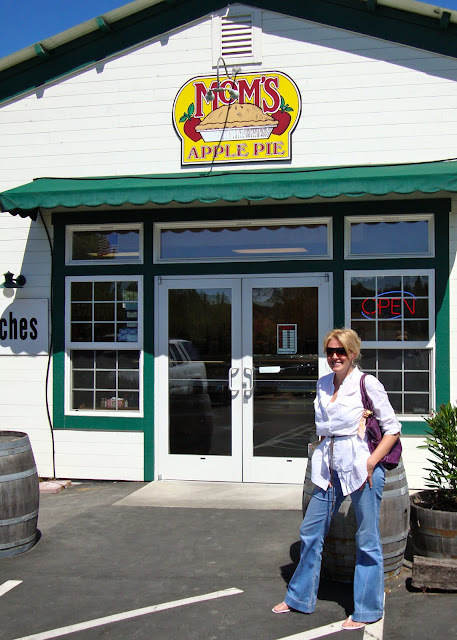 I had heard about a little place in Sebastopol, CA called Mom's Apple Pie. While it was about 30 minutes out of our way leaving Sonoma wine country, my husband agreed to the adventure. We drove. We turned around twice. We snaked our way through tiny towns in Northern California that made me drool. We started seeing acres and acres of apple orchards and I knew we were close. What could be better than a fresh apple pie from the orchards in wine country? And what could be more fun than adding a stop at a cute pie shop owned by a sweet lady named Betty? Enjoying my delicious apple pie, I was definitely in the PEZ. And I'm positive it would be great breakfast pie the next day. I highly recommend this side trip if you are ever in the area! And I am loving the link on here to Pie of the Month Club - they have a great map of Pies Across America! awesome post! i definitely need to scour that pies across america map a little more.